The first day we got here about 9am (after a grueling 1 hour long drive through peak hour traffic across Brisbane...) and we were shown around the center. Calvin had a sleep in the car on the way so he was good for the morning until the afternoon sleep. We enjoyed playing on the great outdoor equipment they have here with lots of other kiddies. Notably a family of 3 rangers - the youngest 2 twins. Interesting talking to the mum because she said it was a bit of a shock for them - neither her or her husband are rangers!! Anyway, finally it was time for Calvin to go for his afternoon nap. They always take it easy with the first nap, since they are still getting use to the new surroundings etc. So, after about half an hour of him crying, we ended up rocking him to sleep. He had a half hour nap as usual. The policy here is that they only try and make them stay in bed for an hour during the day, so since he cried for half an hour and then slept for the rest, it was up time after that. There's a fair bit to do to keep us busy here during the day. We've been to a talk both afternoons - the first day it was about sleep (what it is, why we need it, how it happens in littlies etc.) and today it was about connecting with your child - i found the first a little ho hum because i've read LOTS on the topic and there really wasn't anything new there for me (plus Calvin behaved VERY badly and a missed lots of it due to taking him out and bringing him back in...). The second was really great. It made me feel like i was doing a great job as a mum for Calvin, and to keep up the good work - reminding me how important my job is, and how much of an impact i really am making on his little life. Onto last night. Calvin had dinner at around 5pm followed by a bath as usual. By 6pm he had his bottle and was put down wide awake and the game was on. He managed to scream fairly consistently for 1.5 hours until he finally gave up and had a half an hour sleep. After this half an hour the fun really began. He cried off and on from 8pm to 10:30pm - we had 2 or 3 times where we thought he'd gone to sleep, but he woke 10 minutes later just to prove us wrong. Most of the time his crying was quite intense, but it slowed up a bit around those 10 minutes until finally he could cry no longer and gave into it. Peace at last. He slept SOLIDLY until about 3:30am - a good 5 hours. From then to 5am he woke a number of times, but each time he self settled. True to form he was well and truly up at 5am. The nurses said that he'd had a really good night, so this morning was not the time to begin trying to fight that battle (i was a bit disappointed about that, but i saw that they did have a point!!). So, overall i am labelling the first night a SUCCESS!!! The next morning was not so successful. After breakfast we had a bit of a play, but by 7:30 he was rubbing his little eyes and pulling his ears. Poor little fella was tired (i wonder why...). By the time i fiddled around with cleaning bottles (not use to having so few...) and this and that it was 8am before we put him down. He cried solidly for A WHOLE HOUR!!! So after an hour we got him up and went out to play for a bit. After he'd had some morning tea and a good play it was time to try again. He cried solidly for ANOTHER WHOLE HOUR!!! I was planning on walking up to Chermside Westfield after his morning nap, so the nurses suggested i take him anyway - he needed the nap and the comfort since he'd not slept a wink all morning, and just about cried himself hoarse. Sure enough, within a minute of me putting him in the pram, he was asleep. I'd hardly done the buckles up!! By the time i washed his bottle, filled up my water bottle and walked to the shops, he had half an hour sleep so we sat and had some lunch together. It was a lovely bonding experience. We had both missed each other so much that morning and really needed some mummy-son time together. I got some Oporto and Calvin and I had a great lunch together. Him in a highchair enjoying some chips (one of his favourite foods!!) and me with a Bondi burger (the food at the hospital is pretty dismal - not that Oporto is any better, but at least it had some flavour!!!). After lunch we had a nice wander around the shops, and wouldn't you know it, he fell asleep again. So, he had 1.5 hours sleep in the pram in total in the afternoon. The nurses said to not feel bad about this - it's not that he had won or i had won, but we had both made a huge amount of progress and we both needed to spend some time together having some cuddles and playing together to just re-cement our bond. The games started much sooner than i expected this evening. After dinner i took him back to our room and popped him in the bath. To say he hated this would be an understatement. He had obviously caught onto the fact that he has a bath every night before bed and as such did not want a bath. The same thing happened when i tried to feed him his milk. We ended up in the play room with some nice dim lights and just 2-3 toys. He played a little and then eventually cuddled up on my lap and took his milk. Thank goodness. I think it's time to start giving him milk with his meals so that i remove that bed time association. After he drunk his milk, we popped him to bed. It was about 6:30 by this point. He cried fairly consistently for about 40 minutes before giving up and going to sleep. I got straight in the shower to enjoy some freedom at last. Sure enough, half an hour later he was awake again. This time it only took about 20 minutes to get him back to sleep, and i only had to go in once. I'm so proud of my little boy. It's now about 9:15 and he's still asleep. And i think that's probably where i should be. I'm fairly sure not many people are still ready by this point, so thanks for sticking it out if you did!! Please continue to uphold us in your prayers if you have been, and i'll (hopefully) pop another update up here later in the week!! 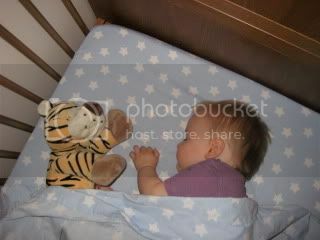 And since no blog is complete without a photo, here's one from September which i like to call "Calvin and Hobbs". A very aptly named photo, and very fitting for this post :) Enjoy! you are doing great Kylie!.... I know how hard it is for you and on poor little Calvin (hence why I only had 2 kids lol) it is hard for a mum to hear her baby cry.. I remember Craig and I standing outside Kirtsen's bedroom door with us both crying our hearts out :( but she finally learnt to sleep by herself... there is light at the end of the tunnel honey... you are doing a great job! You are both doing great! Keep up the good work.